100 Cities. 100 Entrepreneurs. 9 Keys for Success. 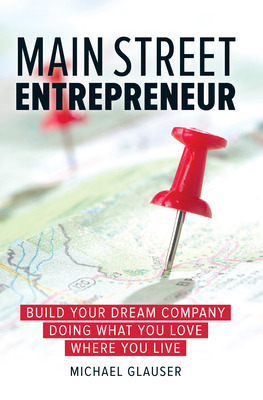 Main Street Entrepreneur offers a unique look at what it takes to create a successful and thriving business. Lifelong entrepreneur, business consultant and university professor Michael Glauser rode 4,005 miles in 45 days, spent 246 hours on a bike seat, climbed 165,748 vertical feet, and interviewed more than 100 entrepreneurs in 100 cities along the way to discover the secrets to entrepreneurial success. Readers will learn how to achieve their own dreams and won't need a 30-page business plan, venture capital, or an exit strategy. All they need to do is implement nine keys for success. Not everyone can build a Facebook, Google or eBay, but anyone with passion and tenacity can do what these entrepreneurs all across America are doing. Michael Glauser, Ph.D., is the executive director of the Jeffrey D. Clark Center for Entrepreneurship at Utah State University, an entrepreneur, business consultant, and university professor. He is the co-founder and CEO of My New Enterprise, an online training and development company. He is also the founder and former CEO of Golden Swirl Management Company and of Northern Lights. Both companies were sold to CoolBrands International. Mike has consulted with numerous corporations in the areas of business strategy, market research, organizational effectiveness, and leadership development. His clients have included Associated Food Stores, The Boeing Company, Department of Workforce Services, Esso of Inter-America, Harmon Music Group, and USANA Health Sciences. Glauser has held faculty positions at the University of North Carolina, Westminster College, and Utah State University. He has designed and taught courses in business strategy, entrepreneurship, management, and organizational behavior. He has published numerous articles in professional journals and magazines, and published two books on entrepreneurship: Glorious Accidents and The Business of Heart. He has appeared on Great Day America, First Business from Washington, The G. Gordon Liddy Show, Voice of America, Good Morning Chicago and Associated Press Radio. He lives in Salt Lake City.